It’s here. Welcome to BLUE NEIGHBOURHOOD, the debut full-length album from the international chart-topping Australian artist, Troye Sivan. Jump in; come along for the ride. There are surprises at every turn. If you already know anything of the Troye Sivan story, then you won’t need any extra encouragement: Just press play. But first, a brief introduction from the artist himself about this milestone new work. 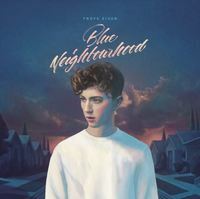 Fans of Troye’s recent WILD mini-album, a certified worldwide pop chart phenomenon in its own right, will have a strong sense of the cutting-edge sonic soundscape that awaits here – the six songs from WILD serve as act one on this expanded electronica opera that is BLUE NEIGHBOURHOOD. It’s a curiously exotic, brooding-mystical-modernistic world, at once capturing-capitulating-celebrating the spirit-anxiety-joy-fears of youth. At its core is the pure, honest, fragile, nuanced, exquisite, anxious, aching, soulful vocal stylings of Troye Sivan. There are many around the world who’ve already pinned this unique sound as the voice of a generation. Comments: Completely new, no damage.